우리나라에서는 최초로 임금이 이름을 지어 내린 사액서원이자 사학(私學)기관이다. 조선 중종 37년(1542)에 풍기군수 주세붕(周世鵬)이 안향(安珦)을 제사하기 위해 사당을 세웠다가, 중종 38년(1543)에 유생들을 교육하면서 백운동서원이라 하였다. 명종 5년(1550)에는 풍기군수 이황의 요청에 의해 ‘소수서원’이라 사액을 받고 나라의 공인과 지원을 받게 되었다. 중종 39년(1544)에 안축(安軸)과 안보(安輔)를 제사지냈고, 인조 11년(1633)에는 주세붕을 더하여 제사지냈다. 서원의 건물은 비교적 자유롭게 배치되었는데 일반적인 서원의 배치가 완성되기 이전인 초기의 서원이기 때문인 듯하다. 정문으로 들어서면 강당인 명륜당이 있고 학생들이 머물며 공부하는 일신재와 직방재가 연속으로 있다. 서원의 일반 배치가 강당 좌우에 대칭으로 동·서재를 두는 것인데 비해, 소수서원은 현판의 이름으로서 구분하였다. 사당은 명륜당의 서북쪽에 따로 쌓은 담장 안에 있다. 서원이 있던 자리에는 원래 통일신라시대의 절인 숙수사가 있었는데, 그 유적으로 당간지주와 초석 등이 남아있다. 소수서원은 조선시대 후기에 대원군이 서원을 철폐할 때 살아남은 47개 서원 중의 하나이며, 지금도 매년 봄·가을에 제사를 지낸다. It is the first local private school whose name was bestowed by the throne. 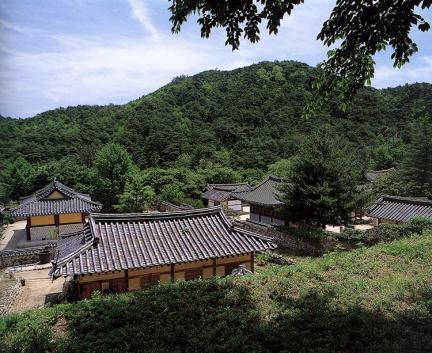 This Seowon, or Confucian academy, was first established as a memorial to An Hyang (1243-1306), a great Confucian scholar during the latter years of Goryeo (918-1392), by a local county chief, Ju Sebung, in 1541, the 36th year of the reign of King Jungjong (1506-44). It was called Baegundongseowon in 1543, the 38th year of the reign of King Jungjong, while it was used as a place for teaching students of Confucianism. King Myeongjong renamed the Sosuseowon in 1550 when Korea's greatest philosopher-scholar, Yi Hwang, better known as Toegye, was the county chief of this area. Thus, it became the first Seowon authorized by the Court and the first publicly accredited private educational institute. In 1544, the memorial tablets of scholars An Chuk (1287-1348) and An Bo (1302-1357) were enshrined; in 1633, the 11th year of the reign of King Injo (1623-49), the memorial tablet of founder Ju Sebung was enshrined here. 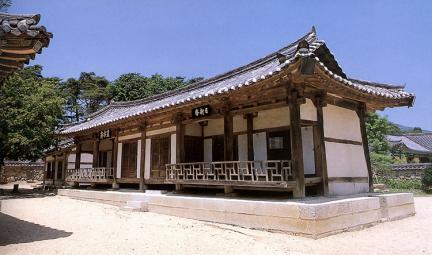 This Seowon is thought to be an early form of Seowon according to the allocation of buildings and was somewhat freely located. Major facilities include the shrine, a lecture hall called Myeongnyundang, two dormitories, several study halls, and the archives. 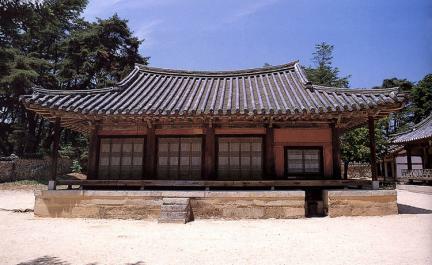 The shrine is located northwest of Myeongnyundang. The flagpole support and base just outside the main indicate that this place was originally the site of a temple called Suksusa. 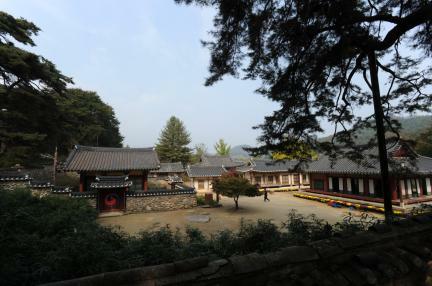 Sosuseowon is the first local private school whose name was bestowed by the throne and one of the forty-seven seowons remaining after the Seowon destruction ordered by King Daewongun of the late Joseon Dynasty (1392-1910). Here, an ancestral sacrifice is performed every spring and fall.